Well fellow Jersey hunters, I've been fortunate to have been invited down to a friends ranch in Texas. He shot a thirteen pointer a few weeks back so I know there are deer on the property. My friend also said there are two other bucks that he has seen that are much bigger than the one he got. I'll be taking my Palmer recurve with me, and a 45/70 Browning and my 7MM rem. I'll also be looking to put the hurt on some hogs as like most other areas he does have a hog problem. I don't know exactly how large the property is but he is 5 miles off of black top, he does not fence his property so what ever is there I guess is free range. Wish me luck, be back in a week. Good luck. Looking forward to some pics. O.K. got back Sunday night, right back to work on Monday. I'll post up ASAP with pics. Got the Pics. finally ! All I can say is for a Jersey guy Texas is a special place, it's so wide open and the woods and bush are so different, at least at this time of year, but I adjusted pretty well. While going to the afternoon hunt my buddy told me he has been on the ranch since he was a kid and has only seen two coyotes, and only got a shot at one of them with the rifle and missed. So he said he would be very surprised if I even saw a yote let alone get a shot at it with the bow. Me trying to be a Trad. die-hard stuck with the bow anyway. While hunting form the ground, as the sun dropped below the trees and you knew dark was on the way, I see a fast moving streak come into my area in a circular movement which brings it about 30-35 yds. from me. Being from Jersey, I think at first glance it's a fox, but then think it's a little too large to be a fox and realize it is indeed a coyote. He is looking from side to side scanning for anything to eat. He then makes another fast moving circular movement which brings him to 6-8 feet from me, and then he looks right at me. 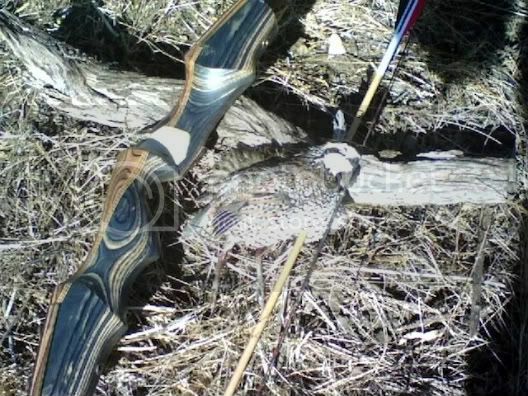 He never knew I was there, I could have reached out with the bow and cracked him over the head, he was so close, but no shot at this time. Then He starts moving and ends up giving me a broadside shot at 15-18, and I blew it, didn't pick a spot and shot right over his vitals. It was still exciting having him that close. It was a great trip for me and I can't wait to back.